Yesterday, attended a session convened by the BCS North London branch, called “Data Privacy – How Private is IT?” The presentation was given by two PWC staff members in two parts, the first was a forward looking review at the proposed EU Data Protection Regulation by Kyrisia Sturgeon and the second part a scenario based exploration of good data protection practice led by Pragasen Morgan. To me the coming key changes in the law are that all companies will need to have a qualified data protection officer, and it implements a right to be forgotten, or more accurately a right to be unindexed. There are redefinitions in scope, there is a new role, that of producers which is aimed at enclosing the system producers, a necessary step as storage i.e. data moves to the cloud. In addition the law is to be extra-territorial, the trigger for “standing” is to be the citizenship of the data subject. (We already have the roles of subject, controller and processor). Data Protection needs to be designed in by default. There will need to be evidence of compliance which means that software developers will need to perform privacy impact assessments as part of the change approval process and this will also have significant impact on the “System Producers”. There is to be a tightening up of the consent rules, which will need to be explicit, permit withdrawal and not be conditional on other agreements. This it would seem is an attempt to reduce bundling of services with privacy consents. The Regulation tries to make enforcement simple and cheap. It’s hard to define the location & hence the jurisdiction of a privacy infringement but the Regulation tries and tries to define a one stop shop for enforcement and remediation. Penalties for corporates for breach of the law are to be increased, to 5% of worldwide turnover (or 100m EUR), this is an increase from the current maximum penalty of 500,000 GBP. The meeting was particularly interested in the Right to be Forgotten. The CJEU has stated that Google must not report on outdated, irrelevant, inadequate or excessive information, specifically if the search argument is a person’s name (or presumably other personally identifying data). The test case involved a (Spanish) plaintiff asking for a newspaper article reporting on a discharged court case to be removed from Google’s index. The current ruling means that Google must be able to delete or suppress entries from search queries. In order to write this blog, I found this blog article at the LSE and this article at insideprivacy.com. (If I have reflected the Law correctly, this suggests that Google’s approach of blacklisting pages on request is excessive.) 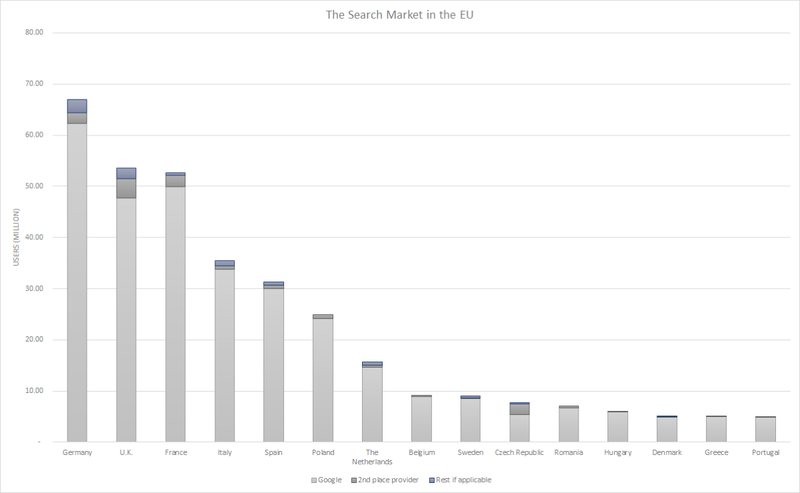 I am assuming that legal behaviour would be mandated on other search engine providers but Google’s European market share is enormous. As a result of this meeting I decided to see what Google’s market share was; it led me to make this page, “Google’s Market Share” on my wiki. Only in the UK & Czech republic is Google’s share under 90% with on the whole Microsoft’s Bing being the second place provider. There’s no question that it has an effective monopoly. This level of market share does not exist in the USA, which maybe one reason why there’s some ‘patriotic’ political resistance to their regulation by the EU. For the caveats on the numbers & chart, read the wiki article. The weight of opinion in the room felt that the CJEU ruling was an over reach; it’s only when you realise that a key part of the judgement is that it’s the query search that breaches privacy, not the retrieval. Otherwise how can it be sensible to restrict Google’s actions while not taking down the linked article/content? This question is answered in the LSE blog, and Google’s 98% market share of European search reinforces these arguments. A further problem for many of those present is how as multi-national companies, particularly the European offices of US companies, could they ensure their software solutions, particularly if they are ‘soviet-style’ client server solutions meet the needs of new European data protection laws. It is my experience that US companies are well aware of the need to meet both local law and the law of the jurisdiction of incorporation. I have written about these issues on linkedin (here & here) and also on my blog (here). The desire to create a onestop shop is going to be difficult. At the moment, it looks like the jurisdiction of incorporation of the controller, processor or producer will determine the regulatory jurisdiction, but this will be complicated depending on who and how many are complaining and where they’re located. There are planned to be triggers for other regulators to declare an interest. The complexity is explained at this Out-Law.com article. It is clearly a sticking point at the Council of Ministers and the British Government is likely to hold out for minimal supra-national jurisdiction i.e. the Government doesn’t want foreign courts deciding on British law. Legal resolution is becoming the bug bear of EU law, most especially when dealing with the digital economy; the internet is challenging the nation state’s jurisdictional monopoly because determining the location of an event is becoming harder and harder. The need for evidence for Privacy by Design will almost certainly create changes in the design and change/release management processes. There is likely to be a need for privacy impact analysis as part of the change impact analysis, although the extent to which this differs from current risk assessments given that privacy is one dimension of the IT security problem is moot. It’ll be interesting to see if the growing need will change standard Security Architecture patterns and the component/role allocation between the application and the operating system. It seems to me that there is going to need to be a new generation of entitlements enforcement solutions. Kerberos and LDAP/AD leave detailed privacy enforcement to the application; companies are going to have to better. All in all an interesting meeting. A lot is going to change. This article has been backdated to the date of occurrence, like many it took me several months to find the time. The key reference’s used in the article are repeated below.